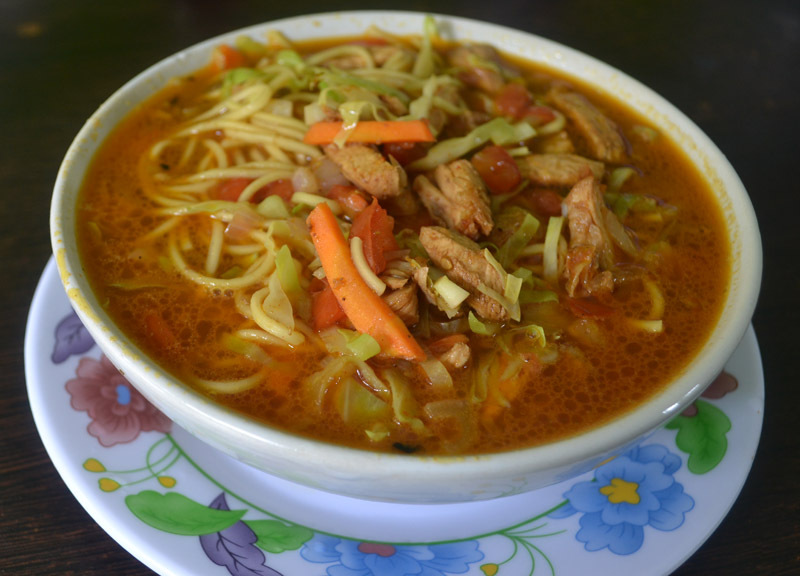 This is the Arunachalese version of Thukpa. I had my first thukpa at a momo hut in Bangalore. That place was run by Tibetans and I was in love with their minimal use of oil and spices and the way they could still make healthy wholesome meals. When I discussed this with a friend from Arunachal he boasted he could do a better job and that's how he taught me this thukpa when he visited my home. The best part about this recipe is that it is wholesome, one pot meal and because it is mildly spiced it is suitable for kids as well. Prepare a stock from the chicken by browning the chicken in 1 tbsp oil and pressure cooking it with 2 cups of water. In another pan saute the finely chopped ginger and garlic in the remaining oil. Now add the onions, carrots, and potatoes and cook them over a low flame covered by a lid. When the vegetables have cooked add the tomatoes and let it soften. Now add the spinach and spring onion. Saute till the leaves wilt. Cook the noodles as per package instructions in the meanwhile. Add the chicken stock and chicken pieces now to the vegetables and bring the broth to a boil. Add salt and the cooked noodles. Let the soup simmer for 5- 10 minutes till all the components blend well with each other.